We can style your vehicle with car wraps, decals, paint & more! Custom vehicle exteriors are the best way to get noticed any time in any place. 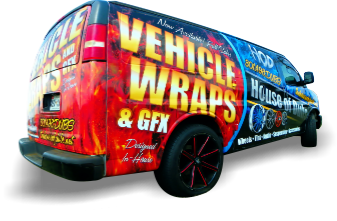 House of Dubs can give your ride that distinct look through several options from custom paint to personal or business vinyl car wraps designed by our in-house studio. Please see our descriptions below to see which application is right for you and your vehicle. Whether you want to attract customers or a good time, we can offer you the presence and visual impact you are looking for. SOLID COLOR CAR WRAPS are premium vinyl material manufactured to look like paint when installed on a vehicle. Its adhesive backing has special properties that makes the vinyl very conformable, releasing air when installing, and not damaging the paint when removing. This is a perfect solution to temporarily changing the color of your car. There are many colors to choose from in gloss, matte, metallic or chrome finishes. If you’re looking for exotic, wrap vinyl comes in many textures too such as brushed metal, carbon fiber, leather, alligator skin, and more! Stop by our store to see samples of all the different types and consult with our vehicle wrap specialists. CUSTOM PAINT is unrivaled for that deep color look. Options can range anywhere from a subtle effect to extreme styling. Color shades are endless and can be combined with different lusters such as matte, gloss, pearlescent, metallic, and even color shifting chameleon! House of Dubs has been painting cars since opening our doors in 2001. Our years of experience guarantees quality workmanship ensuring that your new shiny paint job doesn’t peel, wrinkle or bubble. Call or stop by today so we can help you pick the right quality finish to bring out your vehicle’s styling so you can turn heads for years to come. TWO-TONE & ACCENTS between panels of your vehicle can enhance its look in certain ways. This can be done with either vinyl or paint depending on your preference. Anything can be done from styling your domestic in tuxedo, giving your import that JDM “japanda” theme, or simply covering all the chrome trim pieces. This popular option can bring out your vehicle’s personality, making it look either classier or more aggressive. Whether you want to keep your current paint job and just coordinate certain panels, or if you want a completely different color combination, the only place to get it done is House of Dubs. FULL COLOR CAR WRAPS will absolutely make you stand out from the crowd! 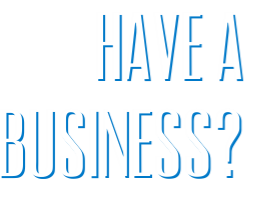 This is the ultimate in personal expression or the best way to advertise your business! You will get thousands of impressions daily parked in the parking lot, driving around town, going to work, and even sitting in traffic. Our graphic designer has over a decade of experience and our prints are made in-house, printed with our brand new state of the art latex printer. You can expect longevity with our printed car wraps which use UV protected inks with your choice overlaminate finish (matte, gloss, etc.) to resist against fading and scratches. Schedule an appointment today to see how we can personalize your vehicle or click here to learn more about using wraps for branding. DIE CUT GRAPHICS and decals are a great way to add a personal touch to your car. Made with premium high performance vinyl, our decal graphics are long lasting but can be easily removed when needed. We can customize the vinyl decals to be any color, shape or size, from stripes, lettering, to your favorite sports team’s logo! 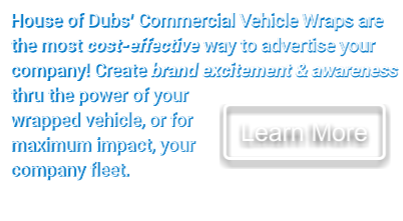 House of Dubs has graphics packages for business applications as well. We can letter your fleet with matching graphics for greater brand visibility, giving you a more professional look when approaching customers and job sites. Already have existing graphics? Not a problem! We can match your existing decals even if you don’t have your design’s original production files. Click here to learn more about our products’ business applications. AIRBRUSH is the solution for truly unique artistic graphics, period. Win trophies at your next car show with your one of a kind ride! Digital production is fine but can seem cookie cutter because they can be recreated, but nothing can come close to an airbrush artist’s time and skill… More popular choices for airbrushing are textures, flames, machine or murals. Whatever you’re thinking, our experienced airbrush artists can create exactly what you have in mind. Airbrushed artwork can also be combined with different paint finishes like metallic, pearlescent, and color-shifting chameleon. Bring your project to House of Dubs and we will turn your ride into a one of a kind show-stopper!